The "Made in America" crowd goes wild Sunday night as Jay Z joins Pearl Jam on stage for a rocking version of "99 Problems"
NBC10 cameras catch Jay Z and Beyonce entering the "Made in America" venue on Sunday. If closing out a two-day festival with an intense two-hour set wasn't enough for Pearl Jam, then bringing out the man who organized it sealed the deal. Jay-Z joined the group for its second-to-last encore Sunday with a rocking version of his signature hit "99 Problems." While Jay closed out the first night of the Budweiser Made in America Festival, he handed the torch to the Seattle-based band grunge rockers and they did not disappoint. Their 25-song set saw tens of thousands of fans jumping, dancing, and singing on the muggy September night to band's well-known tracks like "Alive," "Better Man" and "Jeremy." For the song "Unemployable," Vedder told the crowd it was about a hard-working family man who did all the right things in life but became the victim of job cuts. He said sometimes the so-called job creators are creating jobs outside the United States. "I want to see more things made in America," Vedder said, to thunderous applause. Vedder also urged people to get out and vote, before a rousing cover of the Clash's "Know Your Rights." Fittingly, the band ended the show with Neil Young's "Rockin' in the Free World." But Pearl Jam wasn't the only big story, as earlier in the day Run-DMC performed for the first time in over a decade. Taking the stage under a video banner that read "Jam Master Jay Forever," the Queens, N.Y., natives were well received by fans who danced to the music and sang along, some better than others. 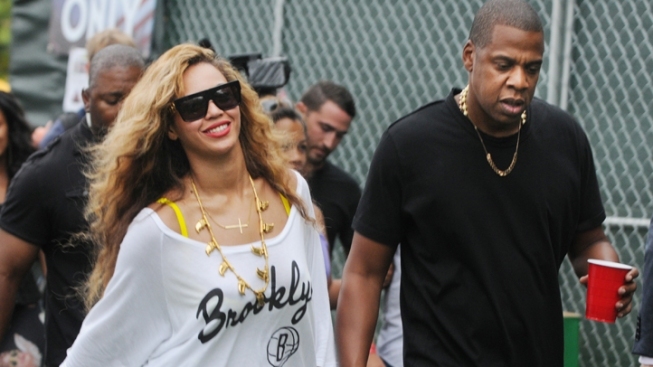 Beyonce and Jay-Z strolled through the crowd flanked by security. Their 40-minute set included "It's Tricky" to a sea of flailing arms, and "It's Like That." Run even put on a pair of namesake sneakers for "My Adidas." But perhaps the most poignant moment came when Run talked about the breakup following the death of Jam Master Jay. "After his assassination ... we put a silence on the group," Run said. Jam Master Jay, Run DMC's longtime DJ, was fatally shot in 2002. The case was never solved. Run introduced Jay's sons T.J. Mizell and Jam Master J'Son who honored their father with "some beats." Afterward, Run said, "Jay, I know you're looking down from Heaven." Other notable performances included Frank Ocean and his Odd Future gang, performing an alternative rap set. Drake played the main stage, aptly named the Rocky stage since it sat at the bottom of the steps where the classic "Rocky" movie scene was filmed. The Canadian rapper, who apparently never met an expletive he didn't like, energized the crowd with a 45-minute set. And if there was a roof over '70s punk band X, it would have blown it off. While the threat of rain loomed for most of the day, the only real precipitation was the Budweiser-soaked earth in front of the stages. The performances all ran on time and the sound was pretty amazing for an outdoor venue. Even the crowd was well behaved with enough space for them to roam. In one funny moment, a large gentleman cut in the bathroom line in the VIP area and opened the door to a portable unit for a brief inspection. Holding back the crowd, he said: "Right here, Miss B." Beyonce took a look, nodded her head, and the entourage continued on. Later, she walked with husband Jay-Z and Rita Ora to catch Drake's performance. It was that kind of night.